Courtesy of Langemarks Cafe, here is a wonderful article about Karen Stephenson and her work in social network analysis, published by Booz Allen & Hamilton's strategy + business, titled "Karen Stephenson's Quantum Theory of Trust"
Aside from a couple parts that make me cringe* it's a great piece. My favorite part is the explanation of the three kinds of nodes in a social network: (1) hubs, (2) pulse-takers, and (3) gate-keepers. This is not your typical list of SNA archetypes, and the pulse-taker role in particular is one not many people talk about. An organizational pulse-taker cultivates a diverse set of close relationships in order to get maximum insight into the organization with the smallest rolodex. 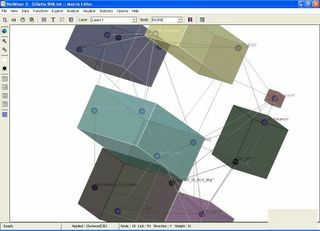 The article presents Stan as a model pulse-taker in the example below: Stan is not as well connected as Diane (who is a hub), but Stan gets good visibility into the whole organiazation with less relational overhead than Diane. Sounds like good leadership material to me. For comparison, many social network analysts talk about brokers (or bridge-spanners), who are quite similar to pulse-takers in having non-redundant contacts. However the idea of a small rolodex of close contacts doesn't occur in your typical discussion of brokers. *PS: The part of the article that makes me cringe the most is how it repeatedly describes network science as emerging from the world of particle physics. Where does that leave Euler, who studied networks in 1736. And honestly, there are so many fields with a hand in the creation of this field that it's absurd to single out particle physics, which didn't care about networks until the advent of computer modeling over 200 years later. One good place to bookmark is the new Social Network page published by LeaderValues. Focused on "Getting Better Results, Together," the LeaderValues organization has built an impressive library for students and practitioners of organizational leadership. All the articles are submitted by experts in their fields. The social networks page features such luminaries as Patti Anklam, Rob Cross, Valdis Krebs, Karen Stephenson, and Duncan Watts. I am honored to be in the company of these and other contributors with this article on "Structural Holes and Collaborative Innovation." Melanie Smith, Editor of LeaderValues, says "LeaderValues is dedicated to furthering knowledge and discussion about leadership and values issues. We serve students of leadership, the academic community and business leaders – with special emphasis on multicultural, transnational issues. "We have been in operation since autumn 1997, and get over 1,200 visitors a day. Last year we reached one million page views. Yahoo! And Google list the site in the top ten in their “Leadership Development” directories. "Subjects on the site include leadership principles, value systems, change, paradox, globalization, corporate governance and innovation. Besides a focus on the 4E’s Leadership Model, we have a fully searchable library of something over 300 guest articles to date. You can find examples a http://www.leadervalues.com/themes/default.asp We also feature a very well regarded and free on-line leadership assessment, analysis on historical leaders, slide shows (with downloads), links and book lists, and a discussion group. The site carries daily leadership news feeds, and we publish a monthly opt-in newsletter. "Founder Mick Yates was Regional Chief Executive for Fortune 50 corporations with special focus on Asia Pacific. He now lives in the UK, working as an independent consultant and writer. You can find out more at http://leadervalues.com/support/default.asp"
"We are very happy for our material to be used for teaching or other purposes, provided appropriate source recognition is given. We are also very happy for LeaderValues to be linked to others." Suddenly we can see the orange square is central in more ways than one. Not only does he have many connections, but he also is far and away the primary broker between the two major clusters in the network. This kind of insight jumps out when using the "explore" capabilities of NetMiner. 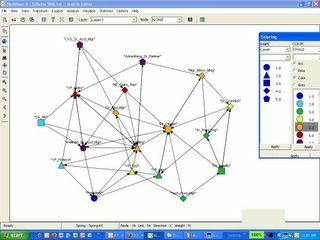 In the above picture, we are exploring clusters of the network using Girvan and Newman's community algorithm. To the far right of the picture, you can just make out the "select level" dropdown. Here Netminer displays all possible ways we can cut our network into relatively self-contained communities; it highlights the most significant cuts with orange and yellow. By viewing significant cuts, we can get a quick intuitive look at who is talking with whom, who is not talking with whom, and who are the brokers connecting them. It is the great tradition of science that our biggest discoveries often emerge from the smoldering ashes of our most disappointing failures. See antibiotics and special relativity for a couple of the 20th century's biggest examples of this. What is a social network analyst to make of this? The network structure is more obscured than enlightened by the 3D effect. And no amount of tweaking can make more than a quarter of the node labels intelligible at any one time. I sat with my laptop in a cafe recently, pondering this seeming waste of technology. When suddenly the woman at the table behind me said, "Excuse me, but what are you working on?" Yes. I had unwittingly stumbled into the SNA "Axe Effect." I've often wondered about the funny paradox of Connectedness---one person's virtually uninterrupted monologue about organizational dynamics. 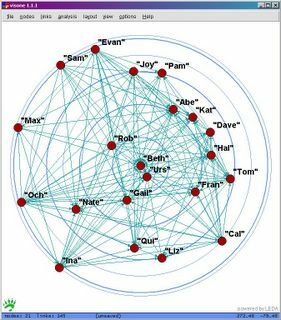 There are many blogs with multiple authors and I could configure Connectedness that way too. That's small potatoes, however, compared to the world of MetaFilter. MetaFilter describes itself: "MetaFilter is a weblog that anyone can contribute a link or a comment to. A typical weblog is one person posting their thoughts on the unique things they find on the web. This website exists to break down the barriers between people, to extend a weblog beyond just one person, and to foster discussion among its members." I learned about MetaFilter today because one of its members posted a link to Connectedness while commenting on this interview about collaborative innovation in business. And suddenly the hits are coming. I guess MetaFilter is popular (or "more addictive than crack," as it bills itself). As happy hour gathers steam this Friday afternoon, let's raise a pint to Jim Murphy, leader of the Massachusetts Bay OD Learning Group. And if you're looking for an especially good pint to raise, may I commend to you Jim's beer website. Even though Patti Anklam and I thought we had the bases covered with our own SNA bibliography, Jim found a few gems worth adding. For two ends of the spectrum, see Verna Allee's article from OD Practitioner, and then look at Ulrike Gretzel's site, which is really something. The exciting thing about this network is that we did it "live." 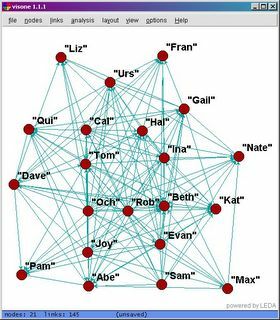 I don't know many stories from people doing SNA on the fly. But now I can say from first-hand experience, it is possible to "map the room" in real-time, even with 70 people. BTW, if you want to do this, I advise you to arrange for a solid RSVP list and an energetic volunteer to handle data entry. Now look again at the network. Can you find the people who RSVPed but didn't show up? Also, which node is the long-time coordinator of Mass Bay ODLG? It looked a lot messier in yarn! Organizations are notoriously resistant to change. But we keep trying. The frustrating thing is that good intentions and hard work have little to do with effecting fundamental change. Without a special set of organizational skills at our command, even our best ideas are likely to be crushed by "business as usual." Sadly, this applies even to social network analysis. Roger Schwarz has made it his business to tackle this conundrum head-on. His book "The Skilled Facilitator" is a classic resource to help facilitators of all kinds navigate the challenges of guiding organizations to fundamental and sustainable change. For those of you not familiar with it, I recommend Schwarz's work as a complement to Peter Block's "Flawless Consulting." Be forewarned (or encouraged, depending on your taste) that Schwarz takes a formal and systematic approach quite different from Block's friendly writing presence. Another useful benchmark is Peter Senge's "The Fifth Discipline." A colleague of mine who works with Schwarz has aptly described The Skilled Facilitator as a de-mystified translation of the difficult lingo developed by Senge, Argyris, Schein, and others you will find at SoL. And now, you can subscribe at no charge to Schwarz's new e-newsletter, Fundamental Change. Before I moved to New England I had never heard of Patriot's Day, but around here it's a big deal. Lots of people get the day off from work, and downtown Boston gives itself over completely to the marathon. Even as I type this, the tail end of the Arlington mini-marathon straggles along Mass Ave outside my office window. All this running around celebrates Paul Revere's famous ride of 230 years ago. "The British are coming! The British are coming!" etc. The Boston marathon roughly retraces Revere's route in reverse. Those of us on this side of The Tipping Point know that the success and fame of Revere's ride are due largely to his prowess not as a horseman but as a connector. If Revere were not such a sociable and well-connected fellow, we could just as well be celebrating the ride of William Dawes, who set out on his horse the same night as Revere did. Dawes was an equally speedy messenger but didn't have Revere's social or political clout, and so his ride, well-timed as it was, did not make much of an impact. For a lively review of Revere vs. Dawes, see this column "Eye on the Entrepreneur" from the Baltimore Daily Record. Also here is an article from Inc. magazine "Connecting with the Connectors" that features a profile of Revere. I got a new laptop last week. Oddly, I found doing product research to be rather nerve-wracking; but once I decided what I wanted, the buying process was a joy. I scanned craigslist and eBay for the late-model Thinkpad I wanted and had it lined up in no time. Then there was a slight hitch when the eBay powerseller called me to report that my purchased item was damaged in his warehouse. But he offered to send me an upgraded model at the same price, so what could I say? I was promised three-day ground shipping, but the UPS guy showed up at my door the next morning. I feel terribly spoiled to say that I wasn't surprised. But really, that everyday style overnight delivery is such a luxury. How does UPS do it? At one level we can thank FedEx for transforming the entire shipping industry (including the federal post office). But at another level we can thank (drum roll...) networks. To appreciate what the UPS network is like, recall instead your last experience in a big airport. Did you fly direct, or did you have to transfer planes? Where did you transfer? How long a layover did you have? These are the questions tackled in large numbers by any airline or freight carrier that must consolidate items before moving them collectively. My first career in networks was devoted to these very questions, via optimization software. By managing these little questions automatically, we created a framework to support higher-level decisions, like what would happen across its entire network if a freight carrier started running a daily truck or flight from A to B (which previously were only connected indirectly)? Then by automating that decision-support, we tackled even bigger questions---like where should a freight carrier open its next major hub? Think about knowledge flow optimization and many issues will be familiar to a veteran trucker. How much do I want to invest in a professional relationship? How much do I need to work with this person? Draw these questions as a network and any UPS dispatcher worth his salt could tell you that the optimal answer depends on having a global view. My relationship with any one coworker has a ripple effect on the organization that we may not appreciate without a conscious invoking of the network perspective. If any of this has made you curious to learn more about UPS, or even if it hasn't, I recommend you check out the latest issue of the New Yorker. "Out in the Sort" by John McPhee describes a colorful journey into the center of UPS' biggest hub, a place far removed from everyday experience (except for the 5000 college students who work there every night from 11pm-4am). Things have been getting crazier around here lately (in a good way) so I am feeling just a tiny bit behind in my blogging. I guess that's inevitable. If I wrote about every good idea I had, how would I ever get to do anything about them, much less think of new ones? In that spirit, what better way to log an entry with minimal effort on my part than by highlighting a couple upcoming events? First is MeshForum, a multi-disciplinary extravaganza in Chicago, May 1-4. I've heard good things about the organizers of this conference, which has a very ambitious agenda to bring together network specialists from all disciplines. I can't make the trip but I am eager to hear about it from any of you who do. In my experience, creating a productive dialogue that includes so many perspectives is challenging, to say the least; but if these folks pull it off, then the participants will have a lot to write home about. After MeshForum, you can fly directly to Boston for the Grantmakers for Effective Organizations (GEO) 2005 KM conference, "Building Learning Organizations." Unfortunately registration is closed for this one (even the waiting list, sorry) but even so I recommend the GEO website to you as a resource for bringing the network perspective to nonprofits. James Surowiecki's latest financial column in The New Yorker magazine covers the decline of Sony since the heady days of the Walkman. Surowiecki explains that Sony's problem is "not invented here" syndrome. Being too proud to recognize valuable innovation outside its own ranks has crippled Sony's ability to keep up. Meanwhile Sony's competitors, less hesitant to give up control and try joint ventures, are thriving. After puzzling over more than enough of these moments, I was relieved when their dreary predictability became a running Sunbelt joke. In the second half of the weeklong conference, spaghetti network pictures were still as common as ever, but more often than not they were announced with a knowing wink: "OK, everybody. Here comes the prerequisite spaghetti network.... And now back to the content of my talk." Less academic audiences can get seriously put off by pictures like these. 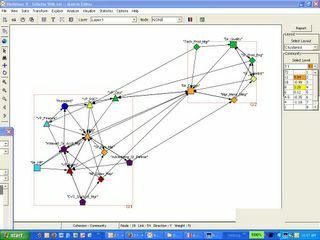 I can tell I've hit that terrible disconnect when I finish explaining SNA only to hear deep sighs, followed by "Wow, that's complicated." Could you tell how central Urs was in the orginal picture? Probably not, but the second picture is drawn so that you can't help but take in who is central in the network. Here we can't help but think, "Who is in charge?" 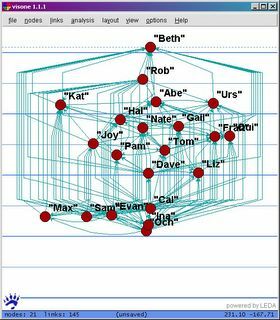 Whatever layout you use to display a network, it's important to respect the power of visualization. For better or for worse, these pictures will lead people to quick conclusions. For more about that, see my previous posts on this topic. Boy, was I excited when my friend at the newswire sent me this story! 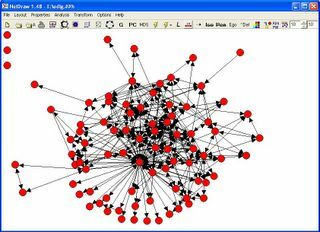 (WASHINGTON, DC) John Bolton announced today his intention to "make the world smaller and more scale-free" by bringing social network analysis to the United Nations. President Bush applauded his controversial nominee, saying, "Today dawns a new era of freedom and democracy. To the evildoers of the world, I say come out of your structural holes, for even now we are only six degrees of separation from you." Democrats, formerly united in their opposition to Bolton, now face a more complicated choice. 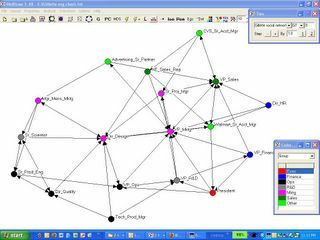 Social network analysis may well improve the workflow of the hopelessly corrupt and bureaucratic UN. However, more skeptical Democrats fear that Bolton's true objective is to oust beleaguered UN Secretary General Kofi Annan by painting him as the "central connector" of the oil-for-food scandal. Secretary General Annan was unavailable today for comment, but a UN spokesperson re-iterated on his behalf, "Mr. Annan looks forward to welcoming John Bolton to our ranks." Other UN ambassadors responded in less welcoming fashion, off the record: "If Bolton wants social network analysis, we say, 'Bring it on.' Let him see just how peripheral an ambassador can be."